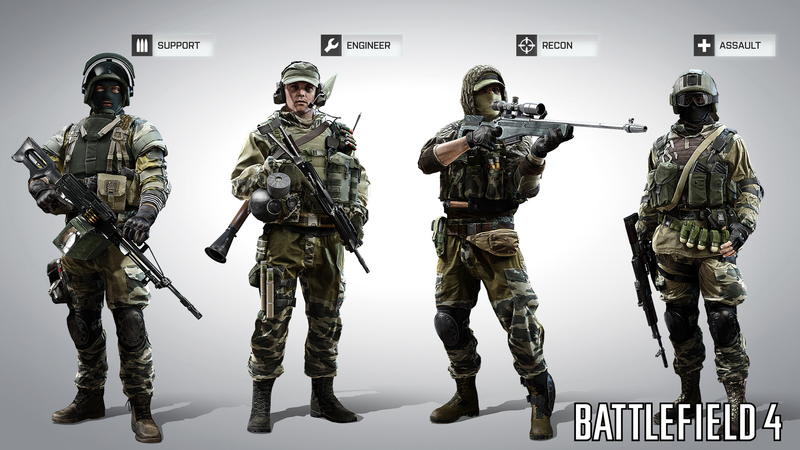 Battlefield 4’s multiplayer classes have received some load-out tweaking. 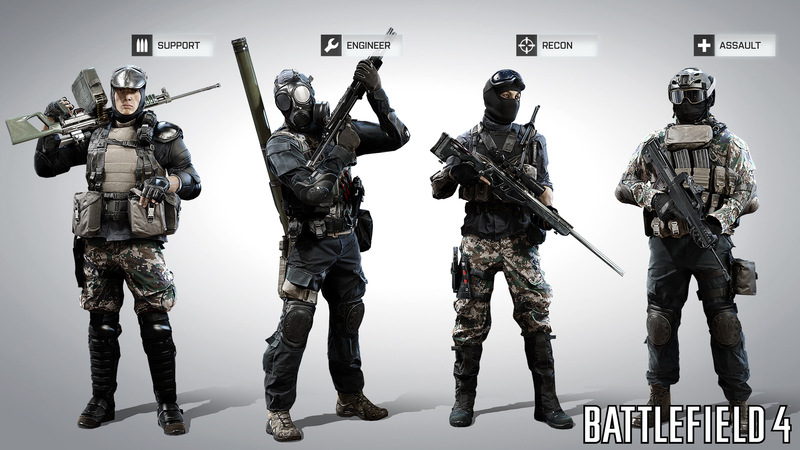 Get your first glimpse of the improved Support, Recon, Assault and Engineer classes here. 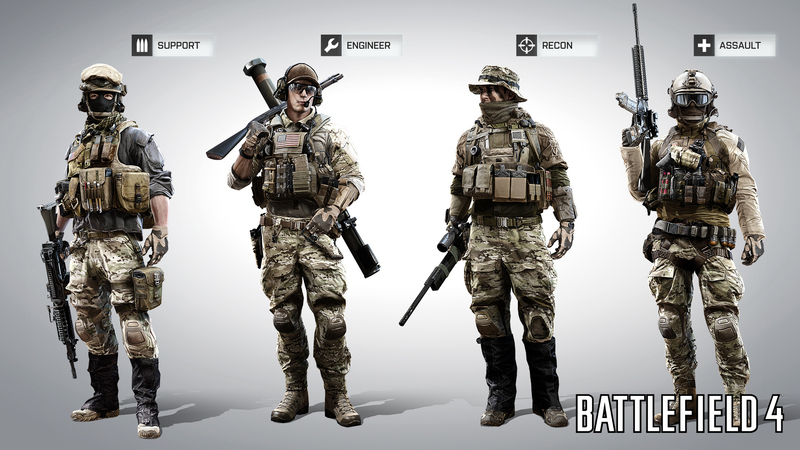 In a new Battlefield 4 blog, DICE’s core gameplay designer Alan Kertz explained that there will be Chinese, Russian and US variants of each class that each look different in the field. Kerts stressed that while DICE used the Battlefield 3 classes as a starting point, there is more flexibility in a certain classes role and sub-role. Offering an example, Kertz wrote, “This time around the Engineer has a lot more variation in anti-vehicle weapons. We’ve also revamped the way we do vehicle disables and guided weapon systems to give the Engineer a broader set of tactics at his disposal. He added that he Support kit has more offensive options this time around, and will keep C4 packs and claymores from Battlefield 3. The XM25 is back to suppress targets, while a new remote mortar can pound enemies from a distance. The class can now equip carbines and DMRs to mix up a player’s firing style. On Recon, Kertz added that he class, “has gotten a much needed boost to mobility, as well as the return of the Spec Ops play style from Battlefield 2. Pack a carbine, C4 (or Claymores), and Motion Sensors and you’re good to go behind enemy lines. Finally, on Assault, Kertz explained that the class, “is still the frontline run-and-gun kit that also serves the role of combat medic. This was one of the major changes in Battlefield 3 compared to Battlefield 2, and one that players have really appreciated. There you have it folks, and the above is said to have been coordinated based on fan feedback, so let us know what you think of the changes below. Battlefield 4 will launch on PC, PS3 and Xbox 360 October 29 in North America, and November 1 across Europe. It’s also coming to PS4 and Xbox One in due course.